Amazon Price: $34.99 (as of October 18, 2017 6:34 am - Details). Product prices and availability are accurate as of the date/time indicated and are subject to change. Any price and availability information displayed on the Amazon site at the time of purchase will apply to the purchase of this product. 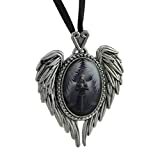 You're a lover of fantasy art, and you love the artwork of Anne Stokes, this necklace fuses both so you can carry your love with you everyday and keep it close to your heart around your neck. 'Prayer for the Fallen' depicts a Gothic angel in black praying on her knees for those that have fallen from grace. She kneels within her curled wings as they embrace the space around her. A beautiful cameo enhanced by angel's wings and a heart shaped bail; it's a piece of wearable art! It includes an 18 inch black satin ribbon with a lobster claw clasp and a 1 inch extender. It arrives in a black presentation box with a clear view window, making it the perfect gift for collectors of the artwork of Anne Stokes.